Ever wonder what happens to the thousands of tennis balls that are left over after a major tournament? Most of them just end up never to be used again. Over 2,30,000 championship tennis balls are supplied for the four Grand Slam tournaments each year. hearO is a Kickstarter program that aims to reduce wastage by recognising that retired championship tennis balls have an untapped potential. 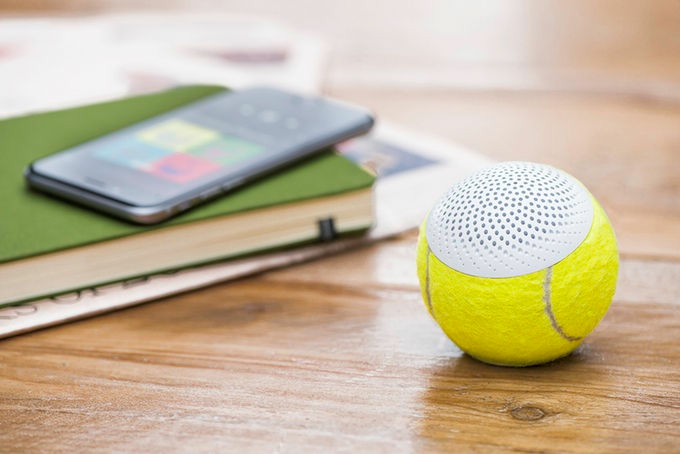 To put things straight, hearO is a high-performance wireless Bluetooth speaker housed inside one of these tennis balls. The company has even created working prototypes that are signed by popular tennis players like Roger Federer and Novak Djokovic. The portable speaker is installed by carefully cutting the ball, which then functions as a tactile protective skin for the electronics within. A single button controls all essential functions, including powering the device on and off, or pairing it with your phone, tablet or computer. When it comes to specifications, the hearO is a top-notch device boasting Bluetooth 4.0 technology. It features a 3W speaker and a 400mAh battery which can offer up to five hours of music playback at 70 percent volume. And that’s not all. The beauty continues to the charger as well, which is a custom cradle capable of charging your hearO through a 360-degree magnetic connection. The beautifully crafted portable design tops it off to make it a one-of-a-kind device. The company has even given the consumers a little bit of personalisation, as you get to choose from a total of six colours for your hearO, or opt for personal engravings on the hearO tin. Interested users can back the project by opting for a hearO set which is priced at £50 (~Rs 4,300).